For 131 years the Methodist people of Centreville worshiped as different entities. And it was with differing backgrounds, customs and prejudices that they became one on February 1, 1959, when the merger of the Epworth Methodist Church and Grace Methodist Church was effected by the Rev. Elwood Cursey. The merged congregation worshiped together for the first time on March 22, 1959. Services alternated between the two churches for a period of one month. Later it was changed to six months in each church. It soon became apparent that neither church facility was large enough nor was expansion feasible. Thus, land was purchased and plans were made to build an Educational Building. Under the pastorship of Rev. Donald O. Hornung, ground breaking was held on June 18, 1961. The Educational Building, now our Fellowship Hall, completed in July 1962 and dedicated on November 20, 1966, was used for both Sunday School and worship until the Sanctuary was built. On September 21,1969, with the Rev. John W. Simpers, Jr. as minister, the cornerstone for the new Centreville United Methodist Church was laid. 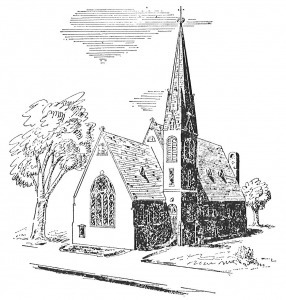 A Service of Consecration of the Sanctuary was held on May 17, 1970. A Service of Dedication was held on December 9, 1979. One of the fascinating aspects of the building program was the transfer of cornerstones from the former two churches to the Sanctuary. Upon removal from the original buildings, the contents of both cornerstones were examined, recorded, and returned. Contents of the Epworth cornerstone of 1857 included the Sunday School Advocate, the Centreville Times, names of lawyers of Queen Anne’s County, the States Rights Advocate, Methodist Hymnal, 1852 large penny, and a Flying Eagle one cent piece dated 1857. Contents of the Grace cornerstone of 1887 included a Bible, five Indian Head Pennies, an 1870 Canadian dime, an 1875 Liberty Seated dime, and a 1777 Spanish silver fifty cent piece. Joining the historic cornerstones on the northwest corner of the Sanctuary is the new cornerstone which was laid September 21, 1969. Contents include a Bible, Methodist Book of Discipline, Peninsula Conference Journal, membership list, names of church officials, contemporary coins, Record-Observer Newspaper, histories of Grace and Epworth Churches, history of the church since merger in 1959, and a list of contents of the other two cornerstones. The church bell in the tower of the Sanctuary was made in 1884 by the McClane Company of Baltimore, Maryland. Weighing approximately 700 pounds, it was originally installed in the Grace Methodist Church, Centreville, when the building was consecrated in 1887. The bell was removed in 1966 and stored by Mr. Lewis Davis of Ruthsburg until its installation at the present site. In May 2000 the church held a Homecoming celebration to mark the dedication of a new organ console and the 30th anniversary of the consecration of the Sanctuary. Shortly thereafter a building campaign began to expand our classroom space and renovate much of the building. The new educational wing opened in September 2007. The renovation of the narthex and church offices in 2013 and the creation of the Memorial Garden in 2014 completed the goals of the campaign. Innumerable memorials have been given for many of the furnishings; the church-sponsored suppers, the work of the church organizations, donations from individuals, and support from our church family have made Centreville United Methodist Church possible. God has been good to our church; we have grown with the community of Centreville since 1959, and these years have been a true blessing for all of our church family. We look forward to continuing this growth in the future, as a place of worship and fellowship for all members of God’s Church. Epworth had its origin, known then as Centreville Methodist Episcopal, with a society which met in the home of Colonel William Hooper in 1773. The first building was erected in 1794 but this frame building was torn down in 1811 for building of a brick Church. This Church was still part of the Kent Circuit of the Philadelphia Conference. William T. Parrott was the first Superintendent of Sunday School in the Centreville Methodist Episcopal Church in 1831 – the first Sunday School in Centreville. 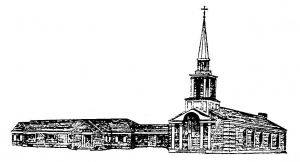 In 1834 on December 26th, the Centreville Methodist Episcopal Church was incorporated. The tearing down of the old to make a place for the new was again fulfilled in 1857 when the brick building of 1811 was torn down and the present building erected (on Liberty Street, next to the county office building). The first sermon in it was preached by the Rev. T. W. Simpers on Christmas Sunday. In 1879 the trustees of Centreville Methodist Episcopal Church were given a piece of woodland known as Wye Camp. The Camp began in 1807 and discontinued in 1912. An outstanding incident of its history is that on the last night of one encampment the services, which lasted ’til daybreak, resulted in the conversion of sixty-one persons. The frame building of 1794 saw the Centreville Methodist Episcopal Church legally and officially organized, but as the years passed the changes mentioned above took place. The final brick building known as Epworth has also had some changes – improvements, repairs, and additions. The Church House and the pipe organ were two of the additions. The Centreville Methodist Episcopal Church in 1939 under the pastorate of the Rev. Branford changed its name to Epworth Methodist Church. The final change took place in 1959 with the merger of Epworth and Grace Methodist Protestant Church to form Centreville Methodist Church. Grace Methodist Church was the first Methodist Protestant Church to organize on the Eastern Shore of Maryland. This movement originated in Centreville, and grew out of a desire to make certain changes in the church government. At the Methodist Episcopal Church on Sunday, December 14, 1828, remarks were made explanatory of the views and purposes of the Reformers, and an invitation given to those desirous of uniting with them. Fifty-three people came forward and were received. 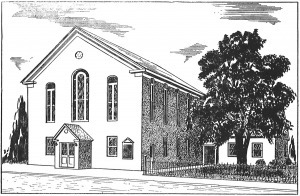 Following the meeting, at a convention called at St. John’s Church in Baltimore, January 1829, the new church as organized under the name of the “Associated Methodist Church” a part of the “Queen Anne’s Circuit”, later to become Grace Methodist Protestant Church. A plot of ground was presented by Mr. William Harper, Sr., on July 9, 1830. Here a plain church house was constructed, later to be renovated and in 1875 have a Sunday School room added. This building was torn down prior to 1887 when a new brick church with a Sunday School room on the front and a memorial window to the memory of Giorge Boyer was erected nearer Commerce Street. This building is now home to the Queen Anne’s County Arts Council. In 1892 the parsonage was build on a lot adjoining the church. In 1920 with an amount of money from Mr. J. Frank Harper from the estate of Dr. R. M. rice and a substantial gift from Mrs. Hattie Dulany the church was redecorated and a new pipe organ installed. During the pastorate of L. C. Randall the Ladies Aid was merged into the Women’s Society of Christian Service. A Church Hall was built in back of the church and parsonage, completed in February 1950. On February 1, 1959 the Grace Methodist Church was merged with the Epworth Methodist Church by the Rev. Elwood Cursey, to become the Centreville Methodist Church. This history was adapted from the programs of the 1970 Consecration Service and the 2000 Homecoming Service. Problems with this site? Contact us.